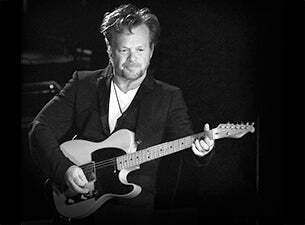 It was a hot and humid Saturday night in Augusta, GA at the Bell Auditorium when John Mellencamp and his Plain Spoken Tour rolled into town. It was in support of his newest album, “Plain Spoken,” and was a night filled with new material and the classics. The auditorium never cooled off since Mellencamp kept the crowd on their feet with a good selection of music. The picture off of the album cover of “Plain Spoken” was suspended behind the stage. Mellencamp and the band, all wearing dress attire, walked out and went straight into “Lawless Times” and “Troubled Man” – tracks off of the new album. As soon as the intro of “Small Town” began, everyone in the whole auditorium jumped to their feet and started singing along. Mellencamp got his groove on by dancing to the opening slide riff of “Stones In My Passway,”a Robert Johnson cover. On several occasions Mellencamp pulled out his handkerchief to wipe the sweat off of his brow. He finally took off his suit jacket halfway through the set. “Human Wheels” showcased a violin solo by Miram Strum. Her violin playing was sprinkled in every song throughout the night, giving them a different kind of flavor. She would really have a chance to stand out front later in the show. Mellencamp was in the middle of telling a story about his late 100-year-old Grandmother when a heckler kept interrupting him by yelling something inaudible. Mellencamp stopped and said, “This guy has been over-served.” The heckler continued to yell in a slurred manner. Finally, Mellencamp having had enough, said, “Save it. We don’t wanna hear it…Shut the f—- up!” The whole place erupted in applause and laughter. He continued the rest of the story that transitioned into the emotional “Longest Days,” which began an acoustic portion of the program. Mellencamp gave a behind the scenes account of the writing of “Jack & Diane,” which included an insinuation of bad boy behavior. Mellencamp then performed the 1982 classic with just an acoustic guitar. He strummed on the main chords while the audience sang along. During the sing along, the crowd skipped the second verse and began the chorus. He stopped and scolded them and continued the rest of the song. Carlene Carter, the opener, was brought back out to sing “Away From This World” from Mellencamp’s new play that is set to premier in the West End of London called “Ghost Brothers Of Darkland County.” Mellencamp mentioned that the play was a project between Stephen King and himself. Mellencamp then brought out the towering Eric Moore for “Tear This Cabin Down,” also from the play. He gave a very powerful performance with his baritone voice. Strum gave a blazing performance during “Overture,” along with Troye Kinnet on accordion. She showcased precision and speed. Everyone in the audience stood for a standing ovation after she finished the masterful performance. Mellencamp ended the set with a string of rocking radio hits like “Rain On The Scarecrow” and “Paper In Fire.” “Crumblin’ Down” had an extended drum solo by Dane Clark. “Authority Song” included an interlude of the Wilson Pickett song “Land Of A Thousand Dances,” where the audience would sing along with the “Na” portion of the song. Mellencamp also said, during the song, “I saw James Brown out front and thought it was so cool.” Well, John, Augusta is James Brown country. He did exactly what he said he was going to do during the close to two-hour show. He played new stuff, deep cuts and the classics. And just like with any other concert, the classics got the biggest reactions. Mellencamp has a way of reinventing himself. He seems to have traded in his leather jacket for a suit jacket. But he still has that rocking mentality that we know and love from him.